Imagine a secret King Salmon fishing hole all your own ! This adventure provides a unique Sport fishing opportunity for King salmon, Silver salmon, Humpies, Rainbow trout, Arctic Grayling and more. 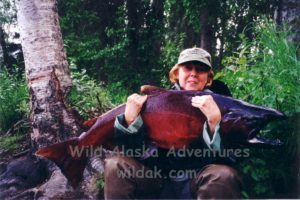 This is Freshwater fishing at its best combining a four wheeler trail ride through incredible primordial forests, heavy runs of Salmon, private airstrip and trail access, hand built Lodge and cabins from local wood and more. 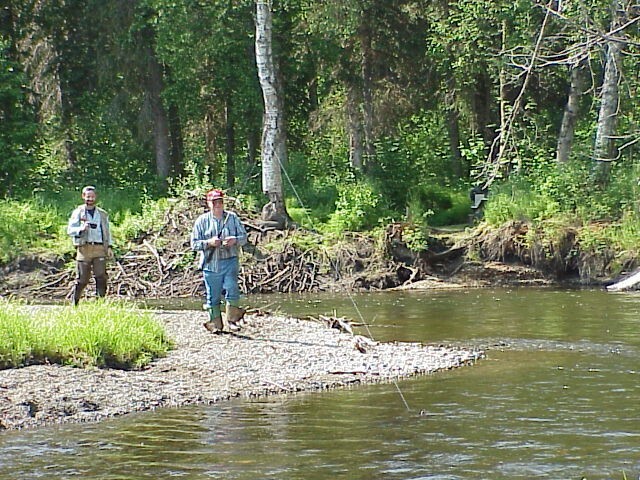 This stream is excellent for fly fishing. Wildlife including Grizzly and Black bear are common as well as Moose and frequently seen offering Photo opportunities at every turn. bald Eagles are usually seen flying by or on the stream fishing. 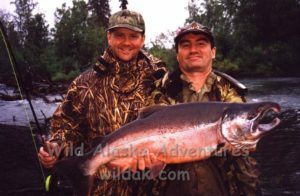 The Salmon will stack up in the slack water providing excellent opportunity for sight fishing. The stream is clear water allowing for fly fishers to target those exceptional Trophy Kings and Silvers. If you have or prefer to bring your own fishing gear, that’s fine. However; we can supply rods and reels, tackle, hip boots, and rain gear. You should bring a day pack for your personal gear; camera, film, polarized fishing glasses, and any other personal items needed. We have cell phone service with wifi and electricity to charge all of your electronic devices. The individual cabins don’t have power but the main Lodge is run on solar power. Don’t forget the mosquito repellent. Your day begins from Anchorage with a 35-minute flight to our Sport Fishing camp. Upon arrival you will be given a tour of our camp, Lodge and cabins and surrounding flora fauna while your Guides prepare for your four wheeler trail ride; Sport fishing adventure. We will then take you on a 35 minute trail ride through some of the most beautiful primordial forest that South Central Alaska has to offer. Grizzly and Black bear frequently use this trail as well as Moose and other wildlife. A camera is a must! This trip includes all food and Lodging with overnight accommodation’s in rustic hand built cabins from local wood on-site and home-cooked meals. We also have a Bear viewing station available with both Brown and Black bears frequenting the site. It can be hair raising at times when disagreements occur between the bears. 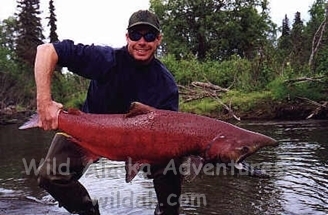 We will do all we can to make your Alaska Sport Fishing Adventure the best ever 24/7. If you have any questions about booking a trip please feel free to call or e-mail. I would be happy to hear from you. All prices include Airfare from Anchorage and return.